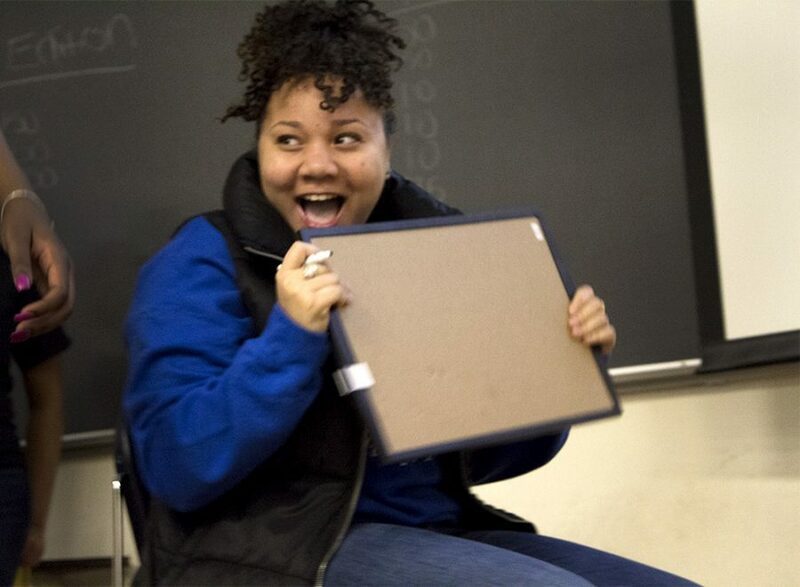 A student smiles while talking with her team mates during Black Card Revoked Monday night in the Coleman Auditorium. Students compete during the final round of Black by Popular Demand: Black Card Revoked Monday night in the Coleman Auditorium. The Delta Sigma Theta Sorority held the second annual “Black by Popular Demand: Black Card Revoked” trivia event Monday evening. 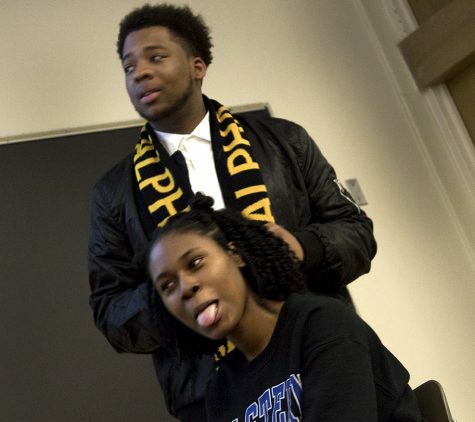 This trivia event consisted of questions that pertained to African American heritage, music and film, along with questions that the chapter president and secretary made up. 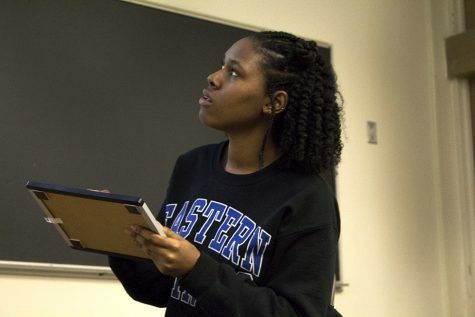 “Black Card Revoked was basically an African American Heritage Month event for all the students to come out to test their knowledge on the black culture, history, music film … and just to see who knows the most about African Americans and their culture,” Chapter President Jakira Smith said. Smith said this was the second year that the sorority had done this event. “We kind of did the same thing last year, (but) this year we actually had more people. Last year we had roughly about 10 to 15 people, so this year the outcome was much bigger,” said Smith. She said their goal was to get more people to show up to this event and to have people involved and become more engaged in African American Heritage Month. Mcgruder said that the event turned out really well and that everyone was synergistic and seemed to be having a great time. The event consisted of a diverse set of students joining together to play the black card revoked game. The students had to separate into two teams and pick a representative from their team to go answer the specific trivia question(s), while taking turns. Whichever person showed their answer first and got it correctly, won the points for their team. A student plays a game during Black Card Revoked Monday night in the Coleman Auditorium. “There is actually a black card revoked game that you can buy, kind of like cards for humanity, but it’s all about black culture. So we based some of the questions off of that, and some of them we came up with ourselves,” Justice Mcgruder, secretary of the chapter said. This was one of the many historical questions asked. Along with those specific questions, Smith and Mcgruder asked jocular ones about black culture to make the event enjoyable and entertaining. She said these questions were just to make people laugh and have fun, while attending the event. If you have never been around to hear these terms or phrases, or if you were from a different background, then it is normal not to understand them, Smith said. African American Heritage Month was first celebrated in 1925 for only a week and in 1976 it expanded to a month of celebration, according to The Library of Congress.